Excavation of Moai 156 (left) and 157. The visible difference in color and texture, and thus in preservation, is due to soil and depth coverage. In 1981, UCLA archaeology graduate student Jo Anne Van Tilburg first set foot on the island of Rapa Nui, which is commonly called Easter Island, eager to explore her interest in rock art by studying the iconic stone heads that enigmatically survey the landscape. Van Tilburg was one of just a few thousand people who would visit Rapa Nui each year back then. And though the island to this day remains one the most remote inhabited islands in the world, a surge in annual visitors has placed its delicate ecosystem and archaeological treasures in jeopardy. On April 21, which is Easter Sunday, CBS’ “60 Minutes” will air a special interview with Van Tilburg and Anderson Cooper filmed on the island, talking about efforts to preserve the moai (pronounced MO-eye) — the monolithic stone statues that were carved and placed on the island from around 1100 to 1400 and whose stoic faces have fascinated the world for decades. Back in 2003, Van Tilburg, who is research associate at the UCLA Cotsen Institute of Archaeology and director of UCLA’s Rock Art Archive since 1997, was the first archaeologist since the 1950s to obtain permission from Chile’s National Council of Monuments and the Rapa Nui National Park, with the Rapa Nui community and in collaboration with the National Center of Conservation and Restoration, Santiago de Chile, to excavate the moai, which most people didn’t know included torsos, which are buried below the surface, prior to her work and the publicity surrounding it. Her success in obtaining permission to dig on the island, she credits to a philosophy of “community archaeology.” She has spent nearly four decades among the people of Rapa Nui, listening, learning, making connections, making covenants with the elders of the society, reporting extensively on her findings. Major funding has been provided by the Archaeological Institute of America Site Preservation Fund. Van Tilburg credits the sustained and generous support of UCLA’s Cotsen Institute as critical to her continued work on the island. She has also made it a point to include UCLA undergraduates from a variety of academic disciplines in the hands-on work on Rapa Nui, including Alice Hom who began as a work study student 20 years ago and who now serves as project manager for the Easter Island Statue Project. Van Tilburg, who received her doctorate in archaeology from UCLA in 1989, is working on a massive book project harnessing her vast archive that will serve as an academic atlas of the island, its history and the meaning behind the moai. She used the proceeds of a previous book to invest in a local business, the Mana Gallery and Mana Gallery press, both of which highlight indigenous artists. And she helped the local community rediscover their canoe-making history through the 1995 creation of the Rapa Nui Outrigger Club. Her co-director on the Easter Island Statue Project, Cristián Arévalo Pakarati, is Rapanui and a graphic artist by trade. Van Tilburg exclusively employs islanders for her excavation work. She’s traveled the world helping catalog items from the island that are now housed in museums like the Smithsonian in Washington, D.C., and the British Museum in London. Van Tilburg does this to assist repatriation efforts. Rapa Nui is more commonly known as Easter Island because Dutch explorer Jacob Roggeveen first landed there on Easter Sunday, April 5, 1722. But the people who already lived there (Polynesian descendants of a massive human migration more than 500 years earlier), simply called the place “home,” Van Tilburg said. The “60 Minutes” interview also focuses on how current residents of the island are coping with increasing waves of tourism, which is almost always a double-edged sword, but is especially so in a fragile ecosystem, Van Tilburg said. The now 150,000 annual visitors pale in comparison to the vast numbers of travelers who flock to Egypt’s pyramids and awe-inspiring archaeological sites, she noted. The intricate rock art on the back of Moai 157. “But by Rapa Nui standards, on an island where electricity is provided by a generator, water is precious and depleted, and all the infrastructure is stressed, 150,000 is a mob,” she said. What’s more disheartening is the frequent disrespectful nature of some travelers who ignore the rules and climb on the moai, trample preserved spaces and sit on top of graves all in service of getting a photo of themselves picking the nose of an ancient artifact, Van Tilburg said. The masses and the increasingly harmful glibness of the travelers are something the 5,700 residents of the island must grapple with. Only in the last decade or so have they been given governance of the national park where the moai are located. In 1995, UNESCO named Easter Island a World Heritage Site, with much of the island protected within Rapa Nui National Park. Van Tilburg’s original impetus behind studying the moai is rooted in her curiosity about migration, marginalized people and how societies rise and fall. Rapanui society was traditionally hierarchical, led by a class of people who believed themselves God-appointed elites. These leaders dictated where the lower classes could live, how they would work to provide food for the elites and the population at large. The ruling class also determined how and when the moai would be built as the backdrop for exchange and ceremony. Population growth and rampant inequity in a fragile environment eventually led to wrenching societal changes, she said. Internal collapse (as outlined in UCLA professor Jared Diamond’s book “Collapse”) along with colonization and slave-trading in the 1800s caused the population of Rapa Nui to drop to just 111 in the 1870s. As an anthropologist, Van Tilburg is deeply interested in equity. Divers survey submersible cages used to farm cobia off the coast of Puerto Rico. UCLA researchers conducted the first country-by-country evaluation of the potential for marine aquaculture under current policies and practices. During its annual meeting in Philadelphia, Pennsylvania, the Organization of American Historians (OAH) announced that Brenda Elaine Stevenson, University of California, Los Angeles, has been selected to receive the inaugural 2019 residency at the University of Augsburg. Thanks to a generous grant from the Fritz Thyssen Foundation, the OAH is pleased to continue the Germany Residency Program in American history at the University of Tübingen. Funding from the University of Augsburg will also enable an extension of the program to the University of Augsburg in 2019. The resident scholar at each university will offer a seminar on a U.S. history topic of his or her design. The residency was announced on April 5 by OAH’s 2019–20 President Joanne Meyerowitz. Founded in 1907, the Organization of American Historians (OAH) is the world’s largest professional association dedicated to American history scholarship. With more than 7,500 members from the U.S. and abroad, OAH promotes excellence in the scholarship, teaching, and presentation of American history, encouraging wide discussion of historical questions and equitable treatment of history practitioners. It publishes the quarterly Journal of American History, the leading scholarly publication and journal of record in the field of American history for more than a century. It also publishes The American Historian magazine. Formerly known as the Mississippi Valley Historical Association (MVHA), the association became the OAH in 1965 to reflect a broader scope focusing on national studies of American history. The OAH national headquarters are located in the historic Raintree House on Indiana University’s Bloomington campus. Researchers said that using popular entertainment can help create a consensus among people to take up behaviors that benefit the community. A team of social scientists, including UCLA political science professor Graeme Blair, commissioned filmmakers in Nollywood, Nigeria’s thriving film industry, to see if media can be used to instigate civic engagement — and the results were promising. The Niger Delta a is a resource-rich land with high poverty rates and is perceived both inside the country and globally as a place where corruption is rampant. Blair was part of a team that worked with local artists and an activist group called Integrity Nigeria to create a feature-length Nigerian movie about corruption — and launch a subsequent text-messaging campaign designed to report instances of government graft. The experimental data-collection project led a record number of Nigerian citizens to report acts of corruption, according to a study published in the journal Science Advances. The two-part campaign generated 241 corruption reports from 106 communities in just seven months, according to the researchers, who are based at Princeton University, UCLA and the Massachusetts Institute of Technology. A previous corruption-reporting campaign yielded less than 140 reports in a full year. Blair conducted the study with Rebecca Littman, a postdoctoral fellow in psychology at MIT, and Betsy Levy Paluck, professor of psychology and public affairs at Princeton’s Woodrow Wilson School of Public and International Affairs. The larger implication of the team’s findings is that norms and nudges combined do work, Paluck said. They commissioned a movie from IROKOTV, the third-largest producer of Nollywood films in Nigeria. The two-hour film, “Water of Gold,” was written by Kabat Esosa and produced by Iroko Partners with Magic Movies Productions. It starred two big Nigerian stars: Yemi Blaq and Mike Ezuruonye. The movie took place in four states in southeastern Nigeria, home to roughly 14.2 million people. Despite the region’s rich supply of crude oil, corruption at the level of international corporations, Nigeria’s federal government, and state and local officials, have contributed to poverty and under-development or have not translated into local development. Today, local residents name corruption as the top problem faced by their country. The film follows the story of a poor fisherman named Natufe and his rags-to-riches brother Priye. The two are close until Priye leaves their village, eventually returning years later as a wealthy businessman. Against Natufe’s wishes, Priye begins to work with corrupt local politicians. Eventually, Natufe becomes outspoken against the corrupt system in which they live. What differed was the plotline of the film. In the “treatment version,” Natufe and a local activist set up a toll-free “short code” telephone number, used for mass text messaging, to encourage community members to report corruption. This took place in six scenes. In the “placebo version,” this part of the storyline is removed. In some regions, viewers were able to watch the treatment version of the film, whereas in other regions, viewers were exposed to the placebo version. The second part of the study involved a mass text sent on a random day to all the people who watched the film. This allowed the researchers to study the effect of the messaging before and after the text nudge. All told, the researchers received 3,316 messages from 1,685 different people. Among these, 241 individuals sent concrete corruption reports explicitly mentioning a specific act, or a person or institution that had committed malfeasance. People most commonly reported bribes and embezzlement perpetrated by politicians, law enforcement and those in the education sector. Seeing the role models of corruption reporters in the film encouraged viewers to report corruption, and separately, individuals who received the text message encouragement were significantly more likely to report corruption. The researchers think the film campaign may have caused reporting due to a perceived shift in norms regarding the community’s anger toward corruption. Funding for the study came from an anonymous private donor and the Canadian Institute for Advanced Research. For four decades, UCLA’s Stephanie Jamison has been somewhat defiantly seeking the stories of women among some of the oldest texts in the world. Jamison’s expertise lies in Indo-Iranian, especially Sanskrit and middle Indo-Aryan languages with an emphasis on linguistics, literature and poetics, religion and law, mythology and ritual, and gender. Jamison will share some of what she has unearthed on April 3 as she delivers UCLA’s 126th Faculty Research Lecture titled “Looking for Women Between the Lines in Ancient India.” They will be names and stories of women we have likely never heard of before. “It is often said that the kind of scholarship that I do, which is very traditional examination of written language, cannot be used to study women and marginal groups, because it’s just not there,” said Jamison, distinguished professor of Asian languages and cultures and also Indo-European studies in the UCLA College. But Jamison would argue that the tools employed through traditional philology (the study of language in literary texts and other written records) are actually well suited for digging beneath the surface of text for exactly those stories, even among the works from colonialist and patriarchal cultures. Even back as far as 1500 B.C. in India. For 15 years, Jamison and her co-author Joel Brereton worked on a translation of the “Rig Veda,” India’s oldest Sanskrit text. Published in 2014, theirs is the first full English translation in well over a century of the text that is considered crucial to the understanding both of Indo-European and Indo-Iranian cultural prehistory and of later Indian religious history and high literature. So looking for and finding women in these ancient texts requires burrowing in as deeply as possible, she said, starting with a very close attention to grammar, literary devices and rhetorical devices, alongside trying to uncover the religious system and whatever we can uncover about history. Jamison was trained as a historical and Indo-European linguist, and earned her doctorate from Yale in 1977. She’s been teaching at UCLA since 2002. She regularly teaches courses in Sanskrit, Middle Indo-Aryan, and old Iranian language and literature, Indo-European and Indo-Iranian linguistics, and undergraduate courses on classical Indian civilization. The Faculty Research Lecture — a UCLA tradition since 1925 — is free and open to the public and will be held on April 3 at 3 p.m. in the Schoenberg Music Building. The galactic chimneys (yellow-orange areas extending vertically) are centered on the supermassive black hole at the center of our galaxy. Kara Cooney, professor of Egyptian art and architecture at UCLA. Over the course of 3,000 years of Egypt’s history, six women ascended to become female kings of the fertile land and sit atop its authoritarian power structure. Several ruled only briefly, and only as the last option in their respective failing family line. Nearly all of them achieved power under the auspices of attempting to protect the throne for the next male in line. Their tenures prevented civil wars among the widely interbred families of social elites. They inherited famines and economic disasters. With the exception of Cleopatra, most remain a mystery to the world at large, their names unpronounceable, their personal thoughts and inner lives unrecorded, their deeds and images often erased by the male kings that followed, especially if the women were successful. 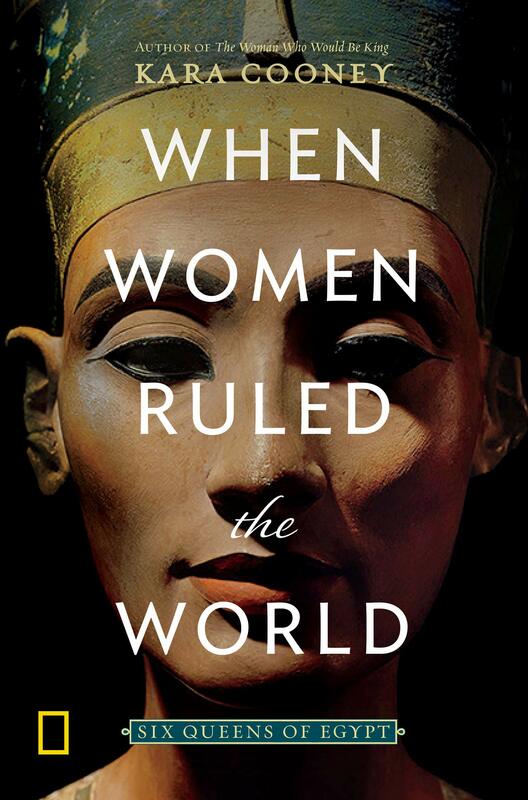 In her latest National Geographic book, “When Women Ruled the World” Kara Cooney, professor of Egyptian art and architecture and chair of the UCLA Department of Near Eastern Languages and Cultures, tells the stories of these six women: Merneith (some time between 3000–2890 B.C. ), Neferusobek (1777–1773 B.C. ), Hatsepshut (1473–1458 B.C. ), Nefertiti (1338–1336 B.C. ), Tawroset (1188–1186 B.C.) and Cleopatra (51–30 B.C.). As we ponder Women’s History Month, and look forward toward a U.S. presidential primary campaign that includes more women candidates than ever before, we asked Cooney about themes of female power and what Egypt can illuminate for us. Your book illustrates that Egyptian society valued and embraced women’s rule when it was deemed necessary, but these are not instances of feminism. Their attempts to rule was really about keeping the set structure in place. Studying Egypt is a study of power, and specifically of how to maintain the power of the one over the many. That story also always includes examples of how women are used as tools to make sure the authoritarian regime flourishes. This is the most interesting part to me because then the whole tragedy of the study, of the book, is that this is not about feminism at all. It’s not about feminists moving forward, it’s not about the feminist agenda. It’s not about anything but protecting the status quo, the rich staying rich, the patriarchy staying in charge and the system continuing. We still do this, us women. Women work for the patriarchy without thinking about it, all the time. In the end, did women rule the world? Yes, they did rule the world but did it change anything? No. I want to look at our world the same way. It doesn’t matter if we have a female president. What matters is how people rule and whose agendas are served. People who have been to Egypt probably know the name Hatshepsut and maybe Nefertiti, but clearly the most pervasive female cultural Egyptian reference is Cleopatra. Why is she the one? Do we just have more materials related to her? No, it’s because when you are successful, you can very easily be erased. Cleopatra failed in her efforts to hold on to power and hold onto native rule in Egypt. When you are a failure, it’s aberrant, strange and it spins a good tale. It’s a great story, failure. Whereas success is doing what everyone did before you and what everyone will do after you. It’s the same and nobody cares. It’s the same as being a successful female in a meeting or a successful female who shares a great idea with her boss and her boss takes that idea into the meeting while she sits there meekly, letting the boss take it for his or her own because it’s a successful, great idea. So it’s the women who are the greatest successes in the story who are the most successfully erased. The women who did it all wrong and didn’t leave their land better than when they found it, who are remembered as cautionary tales. That’s our cultural memory. That’s why everyone can pronounce the name Cleopatra and no one has any idea how to pronounce Hatshepsut. She is not in our cultural memory. It doesn’t serve our patriarchal system to add her to it. But remember, in the Egyptian mindset Cleopatra wasn’t a failure. She fought Rome and lost, but in the Arabic sources Cleopatra is remembered as an adherent to Egyptian philosophy, a freedom fighter against Rome and as a learned patriot to her people. How does the framework of Egypt’s long and relatively well-documented history and culture inform our perspectives on power as American citizens, a country of such a comparatively short history and governance? Egypt is such a gift. When I get asked — and I do — “Why bother devoting your life to this place that’s been gone for 2,000 years and studying people that are as old as 5,000 years?” the answer is that Egypt provides me with 3,000 years of the same cultural system, religious system, government system and language system. I can follow them through booms and busts, through collapse and resurgence and see human reactions to prosperity and pain. That’s really useful. We are in this infancy of 250 years and we think we are so smart, we think we are post-racial, post-sexist and all of these things. But we’re not. Egypt is a huge gift to compare the situation that you are in to the past to see how you might better face the future. It must be difficult to unearth women’s stories because of the ways in which historical records from around the world largely excluded information about them. That’s the frustration of working with Egypt. We can’t forget that this is an authoritarian regime. It’s not a competitive place where I can get a speech from a competitor and try to understand a different viewpoint and agenda. It’s my responsibility as a historian of this regime to try and break it down and see what the truth is between the lines. For these women in power it’s even harder because so many of them were erased when their stories did not fit the patriarchal narrative. My job is to be a historical reconstructionist without being a revisionist. I’m interested in seeing how people work within a system and why we are so opposed, even hostile, to female power. Why are we so hostile to female power? The stereotype is that the female is going to use emotionality, her own and others, to manipulate and lie, to shame and guilt people into doing something. The man somehow won’t do that. He will be a straight shooter. There is the idea that there is the masculine emotionality and a female emotionality. This female emotionality, which many men also bear, is the reason we don’t allow them to wield power because they’re happy, sad, up, down. They feel too many emotions that cannot be allowed. The men that we ask to lead must suppress those emotions and show this even-keeled strength or only anger and no other softer emotions and then only strategically. We demand a kind of emotionality from our leaders that I find quite stunted and I want to know what the evolutionary biology of that is because a lot of this is a knee-jerk reaction to what serves us better in a short-term, acute time of crisis. I think we all need to discuss what it is about that female emotionality, of connecting with our own emotions and others or even manipulating our emotions for our own gain, that is so problematic. As of now, six women have announced Democratic presidential campaigns for 2020. What does our historical knowledge of what happens to women when they seek power bode for the coming election season? I get rather cynical about it, to be honest. Already I see the dialogue revolving around deceit and not being a straight shooter. Again, it’s that double standard that you wouldn’t necessarily get with a man. It’s interesting to see how people are judging women based on emotionality and how much of that they show, how ambitious they seem to be and how duplicitous they may or may not be. That possibility for deceit is something we are quite obsessed with for female candidates. The possibility of lies by the female is that much more powerful than the outright, absolute fact of deceit by a male candidate or leader. That is very interesting to me. The female is assumed to be a liar, but when a man lies he’s doing it for a reason and he’s on my side so I’m cool with it. We’ve been discussing racism for some time but we do not discuss our hostility towards females in power. Unless we start to talk about it and openly discuss it, it won’t change.